The book advances knowledge about climate change adaptation practices through a series of case studies. It presents important evidence about adaptation practices in agriculture, businesses, the coastal zone, community services, disaster management, ecosystems, indigneous populations, and settlements and infrastructure. 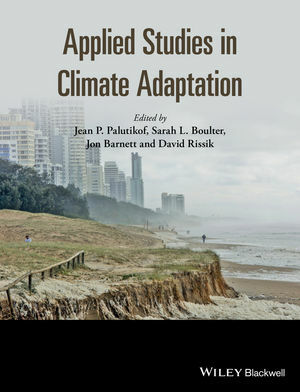 In addition to 38 case studies across these sectors, the book contains horizon-scoping essays from international experts in adaptation research, including Hallie Eakin, Susanne Moser, Jonathon Overpeck, Bill Solecki, and Gary Yohe. Australia’s social-ecological systems have a long history of adapting to climate variability and change, and in recent decades has been a world-leader in implementing and researching adaptation, making this book of universal relevance to all those working to adapt our environment and societies to climate change. Jean Palutikof is the Director of the National Climate Change Adaptation Research Facility (NCCARF) where she has built a national program of adaptation research, communication and partnerships. Prior to joining NCCARF she managed the production of the Intergovernmental Panel on Climate Change (IPCC) Fourth Assessment Report for Working Group II (Impacts, Adaptation and Vulnerability). Her research interests focus on climate change impacts, and the application of climatic data to economic and planning issues. Sarah Boulter is a Research Fellow with NCCARF where she works on synthesis and communication of adaptation research. Her research background includes studies of biodiversity and reproductive ecology of forested systems and the impacts of climate change. Jon Barnett is a Professor and Australian Research Council Future Fellow in Geography at The University of Melbourne. He is a political geographer who researches the impacts of and responses to environmental change on social systems in Australia, East Asia and the South Pacific. David Rissik is Deputy Director (General Manager) of the National Climate Change Adaptation Research Facility responsible for the day-to-day management of the Facility and the Synthesis and Integrative Research Program. He has interest and experience in the delivery of applied research to practitioners in ways that are easily accessible and useful. His research background is in coastal and estuarine ecology and management.